A Navy fighter jet comes in for a landing on the aircraft carrier USS Carl Vinson in the South China Sea. Crew members exercise in the hangar bay below the flight deck of the USS Carl Vinson in the South China Sea. 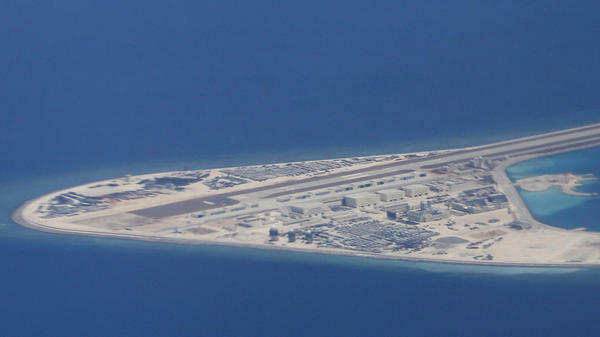 An airstrip, structures and buildings on the man-made Subi Reef in the Spratly chain of islands in the South China Sea are seen from a Philippine Air Force C-130 transport plane last year. Fighter jets as well as early warning aircraft and helicopters are parked near the control tower of the USS Carl Vinson in the South China Sea. 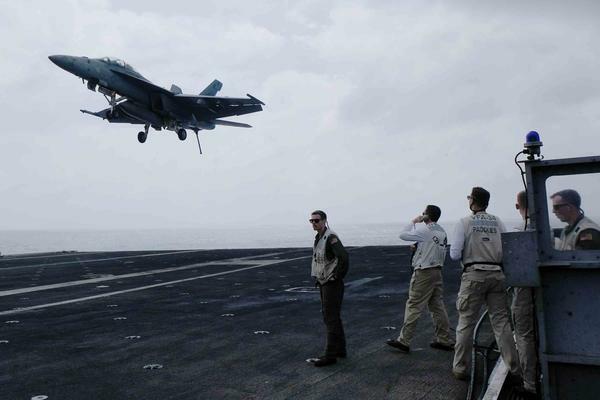 A Navy fighter jet prepares to take off from the deck of the aircraft carrier USS Carl Vinson in the South China Sea. The carrier is on its second extended deployment in the Western Pacific in two years. A mechanic works on the wing of a Navy fighter jet in the hangar beneath the flight deck of the USS Carl Vinson. 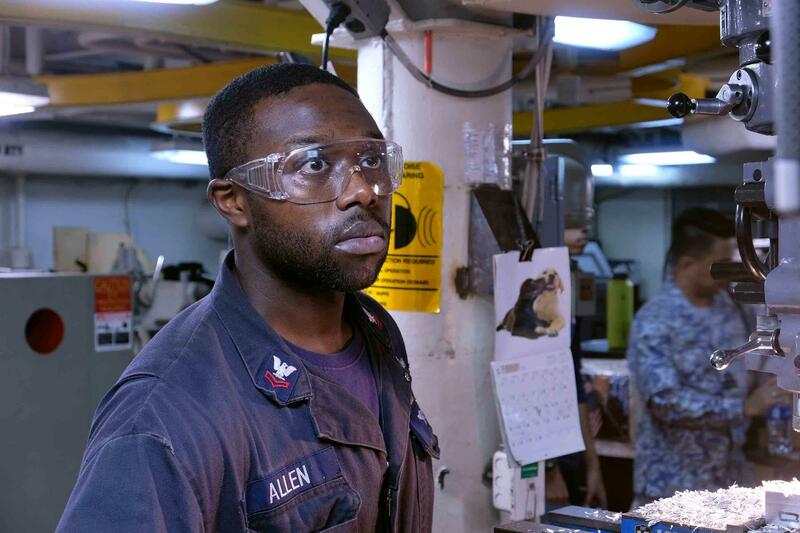 Machine repairman Matthew Allen mills a block of aluminum in the machine shop of the aircraft carrier USS Carl Vinson. The shop can make most of the parts needed for the machines aboard the carrier and its strike group. 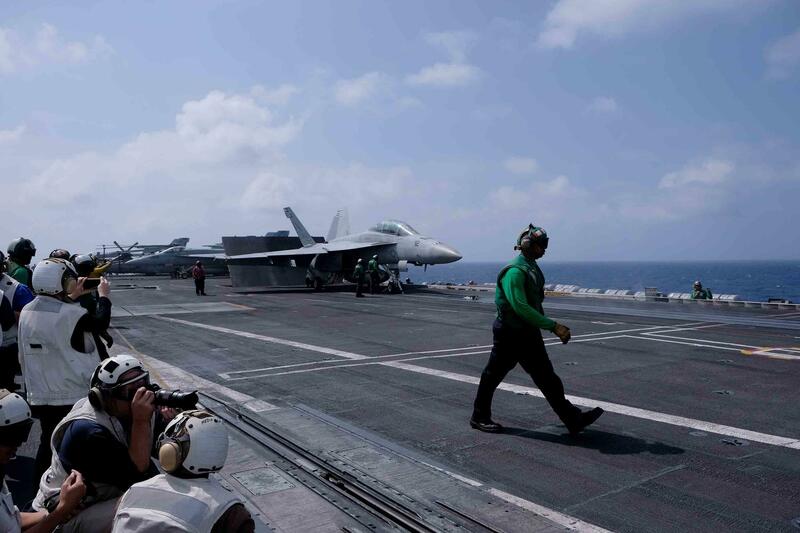 The Navy invited journalists from the Philippines, Indonesia, Malaysia, Singapore, Australia and the United States aboard the carrier last week. The ship was traveling through the middle of the South China Sea, east of the Paracel Islands, north of the Spratly Islands and west of the Philippines, according to the ship's commanding officer, Capt. Douglas Verissimo. China considers the area its backyard, somewhat as the United States views the Caribbean. In recent years, China has reclaimed land on some of the islands and has installed airstrips, hangars and weapons systems, despite Chinese leaders' pledges not to militarize the islands. Vietnam and the Philippines have also built on some contested islands in the area, but to a far lesser extent. "We have an entire floating city here, with machine shops and everything else that it would take not just to fix the aircraft carrier, but to maintain those ships and those aircraft that we deploy with," Verissimo says. The strike group includes a carrier air wing, two guided-missile destroyers and a guided-missile cruiser, with more than 6,000 combined crew. On the ship's deck, journalists watched F-18 Hornet and Super Hornet jets practice taking off and landing, with trails of smoke and a thunderous roar. The more the 70 aircraft aboard the ship include early warning aircraft, electronic warfare planes and several types of helicopters. The USS Carl Vinson's home port is San Diego, but for the second year in a row, it has been operating in the Western Pacific for months at a stretch. The Navy has done this as part of a policy it calls "3rd Fleet Forward." The 3rd Fleet was created in 1943 and participated in decisive naval battles in World War II's Pacific theater, such as the 1944 Battle of Leyte Gulf, under the command of Adm. William F. Halsey. From 1945 to 1973, it served as a reserve unit, providing training and backup. Beginning in 2015, the 3rd Fleet was assigned to operate west of the international date line under its own command, from San Diego, instead of under the 7th Fleet's command in Japan. This arrangement "provides [military officials from] the Pacific Fleet Commander on up more options, it allows them to be more flexible, when you have two numbered fleets working in concert with one another," Lt. Cmdr. Timothy Hawkins, a public affairs officer with the first strike group, explained. At a conference last year, then-3rd Fleet commander Vice Adm. Nora Tyson said that in the event of a conflict on the Korean Peninsula, the 7th Fleet could handle that, while the 3rd Fleet could be deployed to handle other contingencies, from humanitarian disasters to security situations in the South China Sea. Verissimo adds that just by its presence, his ship sends an important message. "We are used often as an information arm, that shows the resolve and gives decision space to our leaders," he says. "When they put a carrier strike group somewhere, it helps to show that the U.S. is interested." The 3rd Fleet's deployment westward shows that "the South China Sea is gaining more attention from the Pacific Command, and probably from the Pentagon," observes professor Renato Cruz De Castro, at the International Studies Department at De La Salle University in Manila. Cruz De Castro adds that the region is now home to no fewer than four potential flashpoints. Besides the Korean Peninsula, Chinese and Japanese military ships and planes are jousting for control of the Senkaku or Diaoyu Islands in the East China Sea. Tensions have also risen around Taiwan, since China-skeptic President Tsai Ing-wen took office in 2016. And then there is the South China Sea, where China has built up and fortified sandy reefs and ignored a 2016 ruling by the international tribunal in The Hague that rejected China's territorial claims to disputed islands. The problem is that if the United States challenges China over Taiwan or the South China Sea, it risks losing Beijing's cooperation on North Korea. This was the subject of a fierce debate in 2016 between U.S. Pacific Command chief Adm. Harry Harris, who saw the South China Sea as the more pressing issue, and then-national security adviser Susan Rice, who was focused on North Korea. Both sides denied that Rice had imposed a gag order on the military over the spat. 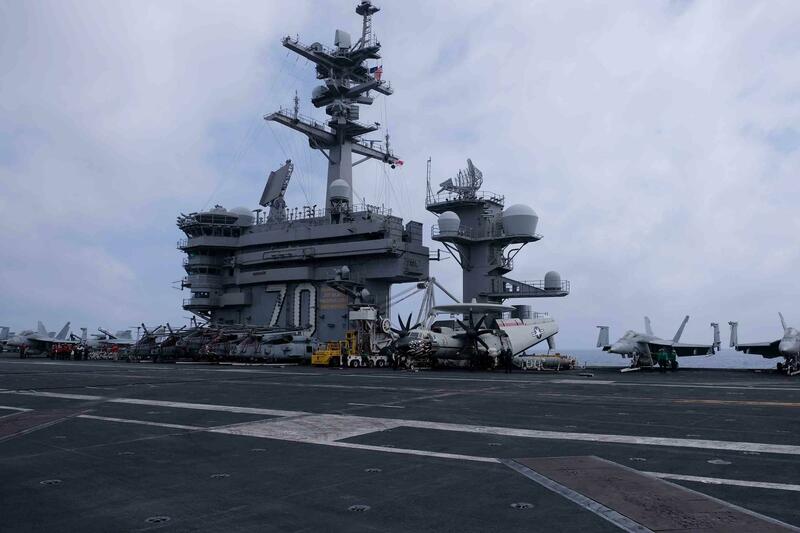 Some ships of the 3rd Fleet have conducted freedom of navigation operations to challenge China's territorial claims in the South China Sea, but Carrier Strike Group 1 has not been involved in any such operations on this deployment so far, public affairs officer Hawkins says. China, meanwhile, has beefed up its military, including developing supersonic anti-ship missiles. China could use these missiles to deny U.S. ships access to its near waters in the event of a conflict. Cruz De Castro notes, though, that the missiles have not been proved effective in combat. Aboard the USS Carl Vinson, Carrier Strike Group 1 commander Rear Adm. John V. Fuller discussed these threats. "We have practiced and trained for contingencies as necessary," he said. "I feel confident that I am going to bring my sailors back home to their families." China has also scored some diplomatic successes prying Southeast Asian allies away from the U.S. In the Philippines, for example, President Rodrigo Duterte vowed to align his country closer to China and Russia and kick U.S. military forces out. He blocked U.S. military access to two of five military bases in the country that a previous Philippine administration agreed to in 2014. "If President Duterte would have it his way, he would push through with his separation from the United States," explains Cruz De Castro. "But he had to take into account those two very important variables: the view of the Philippine military, and of course, our security partnership with Japan," both of which favor closer ties with the United States. Verissimo, meanwhile, insists the 3rd Fleet's deployment westward is not aimed at China. "I'd like to shy away from countering anybody specifically," he says. "But we are certainly here to keep the norms and customs that we've been used to over the last 50 or 60 years. We don't want to change that." One thing that is sure to get Beijing's attention is that the USS Carl Vinson will be docking in Vietnam this month, the first U.S. carrier to do that since the end of the Vietnam War, 43 years ago. Vietnam is one of several of China's neighbors embroiled in disputes over islands in the South China Sea. The 3rd Fleet's westward deployment comes after two major accidents in the 7th Fleet last year shook the Navy. Two collisions took the lives of 17 sailors. An investigation concluded that the fleet was conducting so many maneuvers at sea that they didn't have time for proper training. Last year, President Trump said he was sending "an armada" toward North Korea. The USS Carl Vinson, which was supposed to be part of that force, was in fact thousands of miles away. 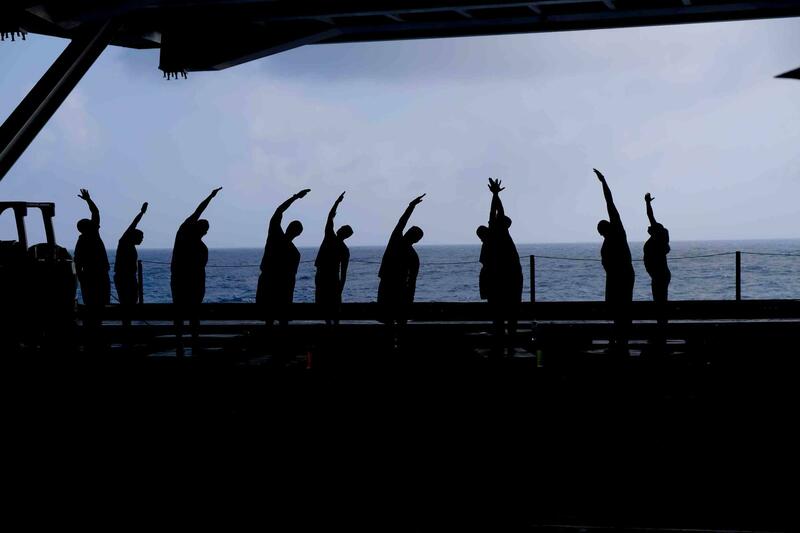 The carrier had to cut short joint exercises with Australia and head north. 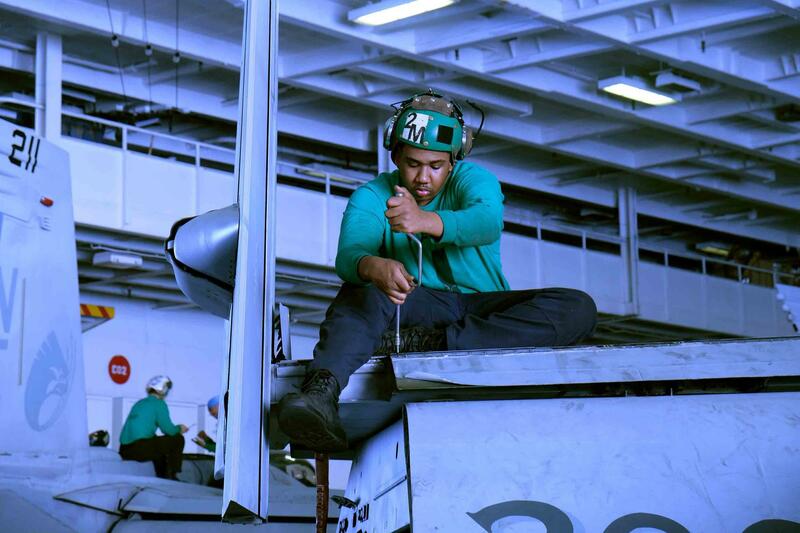 After two years of deployments in the Western Pacific, the crew members of the USS Carl Vinson are gradually adapting to the pressures of being away from home for half a year at a time. "I do feel down sometimes, but I'm a very positive person," says machinery repairman Matthew Allen, taking a break from milling a block of aluminum down in the shop. "I look at all the positive things that'll come after this, and my wife's smiling face as soon as I come back home — that's everything I look forward to." He adds that he is not too worried about the risk of a conflict during his deployments. He says he is confident that his commanders have a good game plan, in case of trouble.